So when the rapper KRS One re-wrote the lyrics for a 1995 Nike commercial – transposing the titular lyric to ‘The revolution will not refrain from chest bumping … The revolution is about basketball, and basketball is the truth’ – Scott-Heron must have felt things had come full circle. What started out as an anthem of Vietnam-era free-thinking had, in the hands of one of his supposed musical ‘godchildren’, become a vehicle for marketing ‘made in Vietnam’ trainers to black youth. 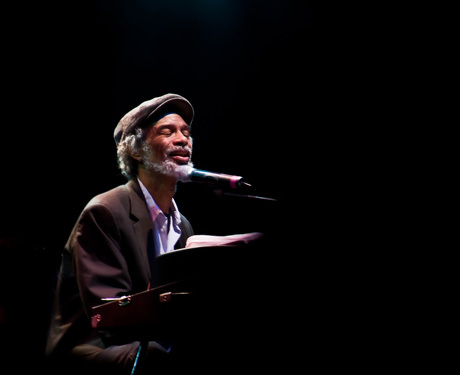 Yet for all the bling excess of much contemporary hip-hop and rap, musically and poetically it’s easy to see why Gil Scott-Heron had such an extraordinary influence on the genres. Most of his first album, A New Black Poet – which includes an overtly homophobic track, ‘The Subject Was Faggots’ – is spoken word, almost as close to traditional poetry as to the soul and funk music with which he became associated later. When Scott-Heron introduces one of the rare melodic tracks, ‘Enough’, by saying ‘A lot of people think it’s a poem, and after they hear me sing it, they’re sure it’s a poem,’ the message is clear: you listen to this for the lyrics. Scott-Heron developed this blend of soulful funk and poetically personal and political lyrical writing in follow-up albums Pieces of Man and Winter in America. In Winter in America he binds together familiar subject matter – politics, urban deprivation, alcohol and drug abuse – with wider themes of pan‑Africanism, afrocentricity and black power. It was during this period that Scott-Heron began to take a more active stance on key contemporary global justice issues. His 1975 single Johannesburg, with its chorus ‘Tell me brother, have you heard/From Johannesburg?’ was among the first pieces of American popular culture to deal with apartheid. With typical wit, Scott-Heron draws parallels between race relations in the US and South Africa. He featured on the 1985 anti‑apartheid protest song ‘Sun City’; and when, in May 2010, the Palestinian Campaign for the Academic and Cultural Boycott of Israel put to him that ‘Your performance in Israel would be the equivalent to having performed in Sun City during South Africa’s apartheid era,’ he pulled the gig. In 1979 he also took an anti-nuclear stance, appearing at the No Nukes concert in Madison Square Garden where he sang ‘We Almost Lost Detroit’, written about the partial meltdown of Fermi 1 reactor in 1966. The 1980s was a relatively fallow period for Scott-Heron. He released several albums, but none were especially well-received, and his record label Arista dropped him in 1985. He battled drug and alcohol dependency for much of this and the later period of his life and served two prison sentences for cocaine possession. It was shortly after completing the latter of these in 2007 that Scott-Heron recorded his first studio album for 16 years, and the one that was to be his last, I’m New Here. Scott-Heron is perhaps the most esoteric of that tiny group of musicians who can claim to have changed not only the musical but the political landscape of the late 20th and early 21st centuries. Like Stevie Wonder, Bob Marley and Marvin Gaye, his music reached out to generations of disenfranchised youth through its combination of soulfulness, beats, raw emotional power and intelligent and thoughtful political message.